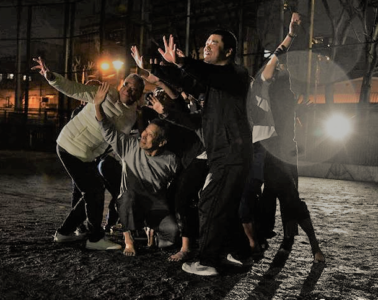 Marking the Start of National Homeless awareness week, Serendipity looks back on the Japanese dance troupe, who rose from the streets. Quite literally. Just two years after the legalisation of dance in Japan is, Dance troupe Newcomer “H” Sokerissa took to the streets of Tokyo in a performance that would shudder the world. Why? All members are either formerly or currently homeless. With no money, surviving on only water for 3 weeks, the end was near for 39-year-old Tokuchika Nishi. Lucky for Tokuchika, choreographer Yuuki Aoki, who started the group ten years before, found him. Like the men featured in this story, the groups’ rise was not easy. Coming under fire from the artistic community, Aoki, ignored criticism from his colleagues and began teaching the men sequences. After an infatuation with ageing bodies, Yuuki Aoki, experimented by teaching the men sequences, however, he soon had to abandon this, giving the men a stimulus in replacement of complicated routines. The group perform in outdoor areas around Japan and famously travelled to Brazil to perform before the Olympic ceremony in 2016. Newcomer “H” Sokerissa, through the help of the man who refused to give up on them, have gone on to attract audiences from around the world. Not to mention the adoration of international press, from the likes of Reuters to Today’s News. With growing fame, Aoki continues to put the emotions of the men first, offering them complete self-expression. After all, the “H” in the name stands for human, hope and homeless. The three things that unite these men.